The wait is over at last. The Ducati Scrambler is finally out of the yellow container that has so jealously guarded it over the last few months and is now – after the previews granted to employees and Ducatisti at World Ducati Week 2014 – officially ready to be revealed to all enthusiasts. This is more than just a new bike: it’s a whole new world, one that expresses itself via a range of versions that provide a starting point for satisfying the different needs and wants of individual motorcyclists. The Ducati Scrambler is a contemporary bike that expresses the pure essence of motorcycling. Tried and tested materials such as the aluminium of the rear swingarm and engine covers and the steel of the teardrop tank and frame are combined with new-generation components such as front and rear LED lighting and LCD instruments. Wide handlebars and a long seat provide a comfortable, relaxed riding position and, together with the low weight, low centre of gravity and slightly knobby tyres, ensure pure riding fun whatever the situation. “Post-heritage” design gives a contemporary take on the iconic bike built by Ducati back in the 70s. This Scrambler, though, is not a retro bike: it is, rather, intended to be just how the legendary motorcycle would be today if Ducati had never stopped building it. The Icon version, in yellow and red, is joined by three others – Urban Enduro, Full Throttle and Classic – each offering its own style and performance-related interpretation of the Scrambler spirit. The Urban Enduro, with its “Wild Green” paintjob, is for enduro style enthusiasts and ready to switch from city streets to country backroads in an instant. The Full Throttle is for riders enthralled by the flat-track racing world who have a penchant for pushing things to the limit. And the Classic is for devotees to details and a 1970s look who want the uncompromising riding pleasure and comfort of a modern-day bike. Moreover, thanks to a vast range of apparel and bike accessories, to be presented in November, the Scrambler offers a virtually unlimited range of exclusive personalisation and lifestyle options. The Scrambler name has much in common with the verb to scramble – mixing up, blending, letting the imagination run free, sharing with others. Ducati Scrambler, the two-wheeled alter ego of those who ride it, is a cultural movement in and of itself. It’s free-spirited, positive and anti-conformist, open to encounters with other philosophies and styles. Ducati Scrambler offers groundbreaking style and substance. Anti-conformist, accessible and essential, the Ducati Scrambler is a perfect mix of tradition and modernity, a stride towards the pure essence of motorcycling: two wheels, wide handlebars, a straightforward engine and endless fun. The Scrambler world – the latest addition to the Ducati universe – is one of authentic creativity and free expression; the lead-up to its official arrival has generated an unprecedented buzz, as has a captivating launch campaign of outstanding originality. First, Ducati wanted to share the arrival of the Scrambler with the employees who constitute the very heart of the company. On 9 June they got an exclusive preview when the factory entranceway was transformed into a beach with music, longboards, street food and a huge yellow container: a surprise event that Ducati had set aside for the inner community of production line/office workers and managers at the Borgo Panigale plant to get them thoroughly involved in the new project and treat them to a very private look at the prototype. From 18 to 20 July, fans flocking to World Ducati Week 2014 were able to enjoy a similar peek at the new Scrambler. When the Ducati Design Center started working on the Scrambler the goal immediately became a very clear one: to revive a legend while, simultaneously, building a truly modern bike. A new bike inspired by the iconic ’70s model but with all the technical specifications of a present-day one. That’s why, for example, the bike features an upside down stanchion fork, alloy rims, a rear monoshock, and front radial-mount calipers. Everything on the Ducati Scrambler has been designed to be as “Ducati” as possible while remaining faithful to the style of its inspiring predecessor. Firstly, there’s the tank, sculptural and lovingly shaped yet loyal to the original teardrop design of the ‘70s model, including the ‘upward sloping’ look. Additional character is provided by the tank side covers: made of brushed aluminium, they’re interchangeable to allow plenty of scope for personalisation and feature version-specific logos. Seat and tank have been formed carefully to give the Ducati Scrambler eye-pleasing proportions. A compact bike, the Scrambler instils confidence from the moment you set eyes on it. It’s been sized to make it accessible to all motorcyclists while its long seat maximises comfort and can accommodate a passenger comfortably, because the Ducati Scrambler is all about sharing too. 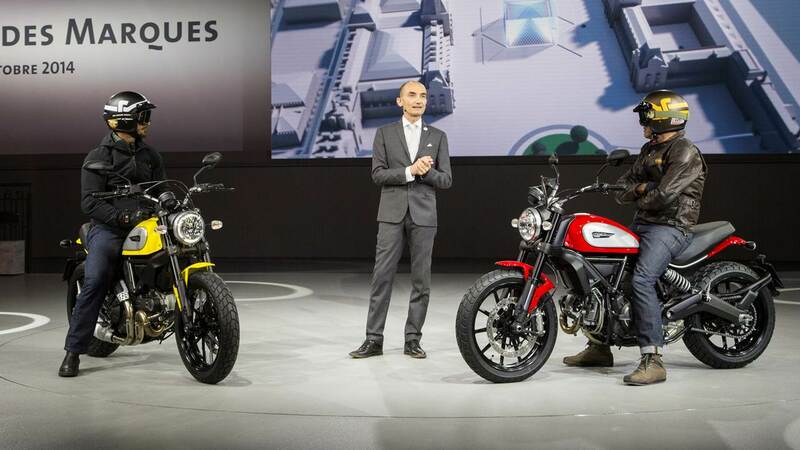 A great deal of thought has gone into every detail on the Scrambler, including the ultra-modern rear swingarm and the exhaust pipe routing, a layout that echoes the look seen on the latest Ducati nakeds. The short silencer and the rear mudguard tip have been designed to make the bike more compact, as have the passenger grab handles, hidden by the openings on the upper part of the seat. Redesigned for the present day, the round headlamp is a key part of the Scrambler look. Ultra-modern LED light guide technology (used for the side lights) underlines the outstanding level of technical expertise. The filler cap, which sports the inscription “born in 1962”, reflects the closure system in vogue in the ‘70s; similarly, the key, once inserted in the switchgear on the headlamp unit, recalls the design of the original light switch. Under-seat moulding provides another ‘70s design throwback. An oil cooled L-twin two-valve 803 cc engine powers the Ducati Scrambler. Derived from the Monster 796 engine, it has an 88 mm bore, a 66 mm stroke and has been redesigned to give smooth acceleration throughout the rev range. The Desmodue engine on the Scrambler has light machine-finished aluminium covers, including those on the clutch and alternator. The two belt covers are also made of aluminium and have, likewise, been machine-finished to enhance aesthetics. To ensure smooth integration with the compact steel teardrop tank, the Desmodue engine on the Scrambler features a single Ø 50 mm throttle body with two sub-butterfly injectors: this solution ensures fluid power delivery and accurate control of the fuel being aspirated into the cylinders. Pistons and crankshaft are the same as those on the Monster 796 and Hypermotard 796 power units, while the camshafts have been designed to ensure linear power delivery thanks to the adoption of an 11° valve overlap angle. The 2-in-1 exhaust with aluminium silencer has been specially designed for the Scrambler. It features an aluminium heat plate for improved rider protection and is EURO 3 compliant. The gearbox is a 6-speed unit while the multiplate APTC oil bath clutch with cable actuation, while emphasising the minimalist nature of the Scrambler, provides a light-touch brake lever with outstanding ‘feel’, a real plus point when it comes to the continuous stop-and-go of inner city traffic. Moreover, it features a torque-linked anti-hopping system that prevents rear wheel chatter when downshifting. The twin-cylinder Desmodue engine on the Scrambler has been designed to favour smooth running and fluid acceleration throughout the rev range, putting out 75 hp (55.2 kW) @ 8,250 rpm and 50.2 lb-ft (6.9 kgm) of torque @ 5,750 rpm. Just like the Scrambler itself, it is designed to be simple and accessible and also features generous 12,000 kilometres maintenance intervals.